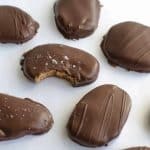 Homemade Healthy Reese’s Peanut Butter Eggs made with peanut butter, maple syrup, whole wheat flour, vanilla, and chocolate will not disappoint! You guys, you guys!!! Homemade Healthy Reese’s Peanut Butter Eggs are going to change your life. I’m telling you what, they are amazing! I made these yesterday with the kids after school and I planned on posting them here on Monday. While we were making them I posted a picture on Instagram and I got such great feedback that I figured I better post them today so that you all could have the recipe over the weekend! Who knew that using a few natural ingredients could turn out so delicious. These have peanut butter, a few tablespoons of maple syrup (which you can’t taste at all in the finished product if you are wondering), whole wheat flour, vanilla, and chocolate. That’s it! 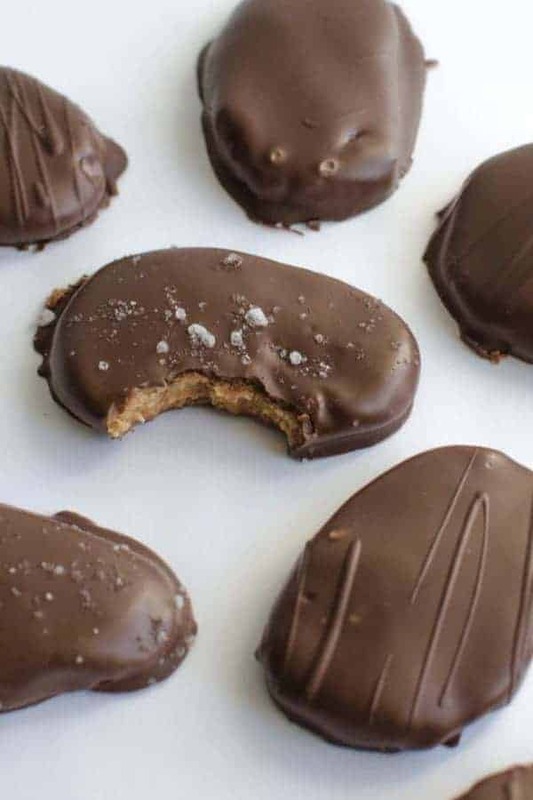 They aren’t nearly as sweet as the commercial peanut butter eggs but they are still so good, everything that is chocolate + peanut butter is good though, amiright?! When it comes to the flour you have a few options. I used whole wheat because it was easy and what I had on hand. You could also use coconut flour or whole oat flour (toss some oats in the blender, blend until fine, measure out flour as needed). I did not try these with a gluten free flour blend though, so proceed with caution is that’s what you’d like to use. The chocolate plays a big roll in how delicious these are and I highly recommend using a high quality dark chocolate. I’m obsessed with these Guittard Extra Dark Chocolate Chips and would recommend them if you are looking for something delicious. Parchment or wax paper or a baking mat are also a must, don’t forget that step. One perk of making these at home is that you can customize them a little. I added a bit of fancy flur de sal (French sea salt) to about half of mine and it was amazing. I’m obsessed with all things sweet and salty so they were little bits of heaven to me. I highly recommend trying it if you are a salty dessert kind person. This recipe is slightly adapted from and inspired by from Emily at One Lovely Life via Super Healthy Kids. My friend Emily tried this with other nut butter and even sun butter and said that it worked great! You could use all kinds of chocolate in theory too, though the darker it is the less added sugar it has. The coconut oil in the chocolate helps it to melt smoothly and to be a bit shiny, you don’t have to use it. You may want to use a double-boiler method to melt the chocolate if microwaving isn’t your thing. 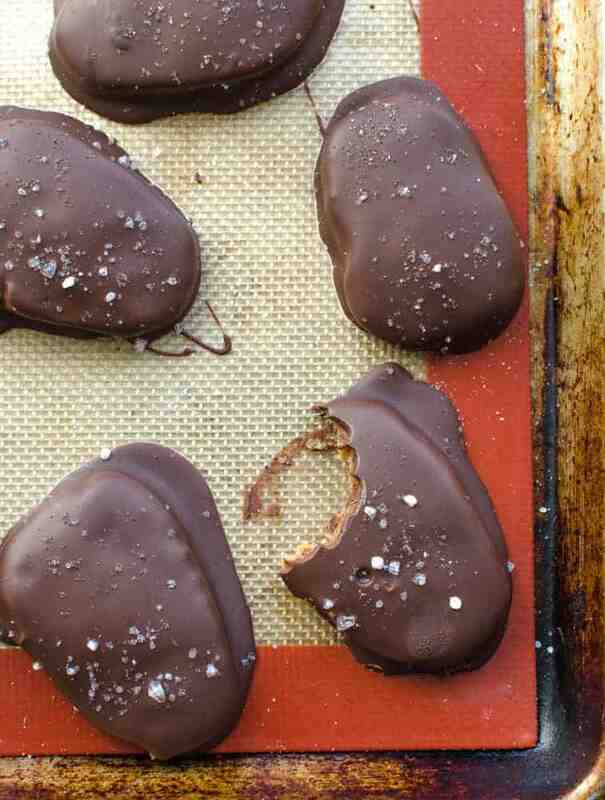 I am obsessed with all things sweet and salted and so I added a little sea salt to a few of mine, it’s optional! How do you melt chocolate without burning it? Bring about an inch of water to a simmer in your saucepan. Using a heatproof bowl, set that bowl in the pot. You don’t want the water to touch the bottom of the bowl. Stir chocolate occasionally as it softens. When you only have a couple of small unmelted chunks, remove bowl from heat and the residual heat will melt the rest. Add the peanut butter, maple syrup, flour, and vanilla to a small bowl and stir well to combine. Let the mixture sit for 5-10 minutes (it needs time to thicken). Line a rimmed baking sheet with parchment paper or a baking mat. When the mixture has thickened give it another stir. Use a spoon to remove a scant tablespoon of the peanut butter dough (it will still be tacky at this point). Quickly roll the dough into a ball and place it on the prepared baking sheet. Repeat with the remaining dough. Aim for having 24 balls of dough when it’s all said and done. Pop the peanut butter balls in the fridge to firm up for 10-15 minutes. After that time, remove the pan from the fridge. Use your hands to slightly press the dough flat and then taper it on one end so that it looks like an egg. 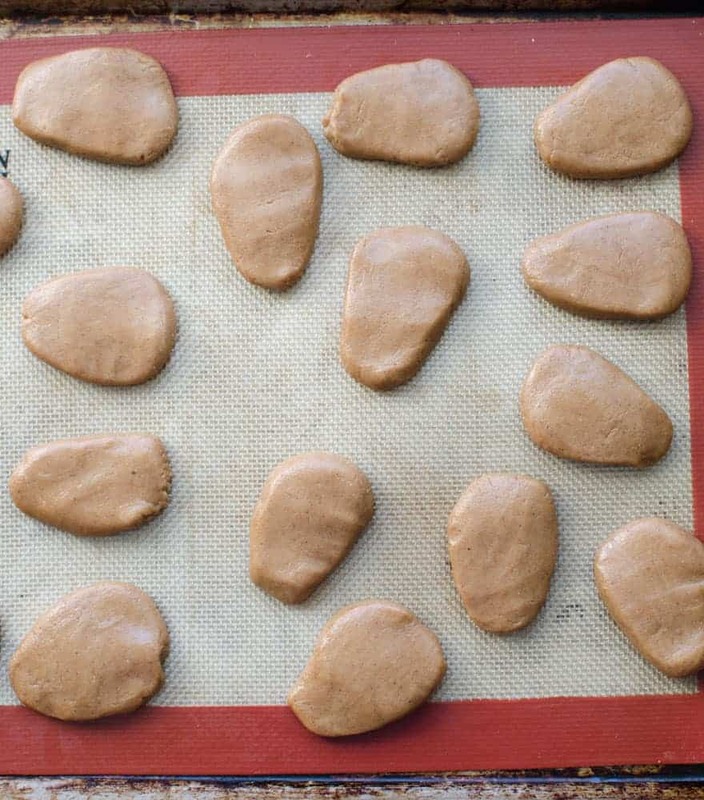 Return the shaped peanut butter dough to the pan and repeat with the remaining pieces. Return the pan to the fridge for another 10 to 15 minutes. When the time is up, prepare the chocolate. Add the chocolate chips to a microwave safe bowl, add the coconut oil. and microwave on high, stirring every 30 seconds until the chocolate is smooth and melted. 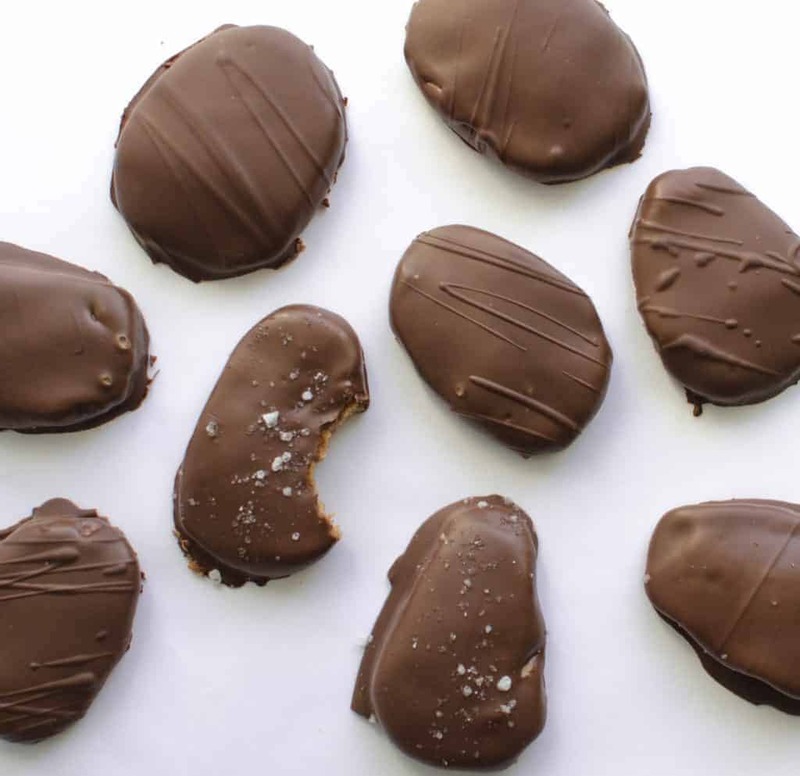 Add a peanut butter egg to the chocolate, one at a time. Make sure it’s covered in chocolate, remove it with a fork, tap the fork on the edge of the bowl to remove extra chocolate, and then return it to the prepared pan. Repeat with remaining eggs. Let the eggs rest at room temperature until the chocolate has set (about 2 hours) or you can stick them back in the fridge to speed the process up. Enjoy! My friend Emily tried this with other nut butter and even sun butter and said that it worked great! You could use all kinds of chocolate in theory too, though the darker it is the less added sugar it has. The coconut oil in the chocolate helps it to melt smoothly and to be a bit shiny, you don’t have to use it. 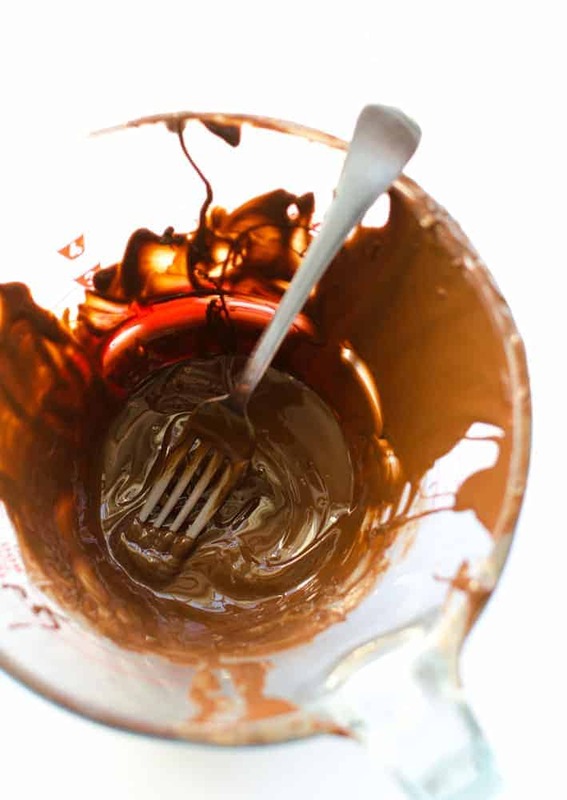 You may want to use a double-boiler method to melt the chocolate if microwaving isn’t your thing. I am obsessed with all things sweet and salted and so I added a little sea salt to a few of mine, it’s optional! Have a great day and make these eggs! You won’t regret it. Happy weekend to you friends! I’m excited to try these! Where do you typically buy your dark chocolate chips? I’m having a hard time finding something that I feel is a good deal! Do you know any bulk ways to buy them? Yum!! Definitely saving this recipe!! This is my favorite Easter candy I’m making these. Thanks! Have a happy Easter! What’s calorie count and nutritional facts?